Hi we may have seen notify popup in various websites like displaying messages to user for couple of seconds and disappears automatically. Its pretty simple by using notify.js file and just need to call notify method with message text along with its type as parameter (optional). 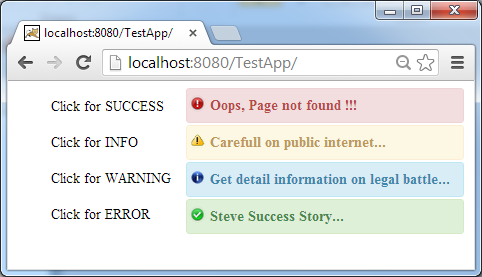 Different messages types and notify styles are "success", "info", "warn" and "error". Lets see simple example for using notify in our web application.